The MOVA Globe turns peacefully on its own, using only the energy of room light and the forces of Earth's magnetic field to simulate perpetual motion. Each globe turns autonomously, whether on a stand or in the palm of your hand. No batteries or power cords are required. MOVA Products unite high tech concepts with high-end design to create a knowledge product that is as intriguing as it is beautiful. The MOVA Globe turns peacefully on its own, using only the energy of room light and the forces of Earth's magnetic field to simulate perpetual motion. Each globe turns autonomously, whether on a stand or in the palm of your hand. No batteries or power cords are required. MOVA Products are the first and only solar-powered item to have the solar panels hidden from view. Beneath the detailed graphic, the solar cell technology silently and calmly rotates the globe to reflect the steady motion of Earth. 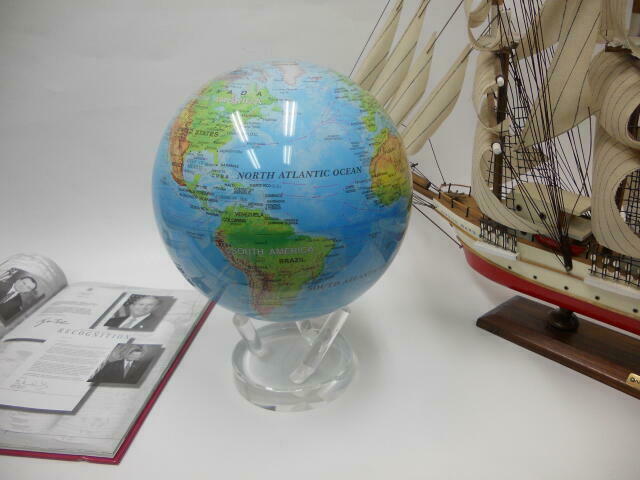 Copyright (C) GLOBE SHOP　All rights reserved.